The sound waves whose frequency is above the upper pitch limit of the human ear are called Ultrasonics. Ultrasonic testing and inspection is one of the most useful non-destructive methods in metal testing. Rail roads, water pipes, boilers, air craft parts of forged materials, etc., are tested for cracks, inclusions or other internal discontinuities. 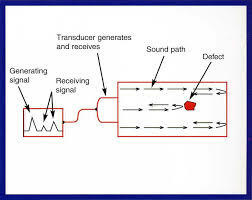 Ultrasonic waves are usually generated by the piezoelectric effect which converts electrical energy to mechanical energy. A quartz crystal is used for the purpose. The surface of casting to be inspected by ultrasonics is made fairly smooth by machining otherwise ultasonic waves can't be efficiently transmitted from the probe into the casting. Before transmitting ultrasonic waves, an oil or water film is provided between the probe and the casting surface; this ensures proper contact between them and better transmission of waves from the probe into the surface of the object to be tested. For carrying out the operation, ultrasonic wave is introduced into the metal and the time intervals between transmission of the outgoing and reception of incoming signals are measured with a cathode ray oscilloscope (CRO). The time base of CRO is so adjusted that the full width of the trace represents the section being examined. As the wave is sent from the transmitter, if the test piece is free from cracks, or flawless, then it reflects ultrasonic waves without distortion. If there are any flaws in the specimen, the time taken by the ultrasonic waves will be less as the reflection of these waves will be from flaw points and not from the bottom of the specimen. Cathode ray oscilloscope (CRO) is used to receive the sound signals,whose time base circuit is connected to it. Knowing the time interval between the transmission of the sound pulse and the reception of the echo signal, we can calculate the depth of the crack. It involves low cost and high speed of operation. This method is more sensitive than radiography. Big castings can be symmetrically scanned for initial detection of major defects. Depth of penetration for flaw detection or measurement is superior to the other methods. Only single sided access is required. It provides flaw distance information. The minimum flaw size which can be detected is equals to about 0.1% of the distance from the probe to the detect. This method of inspection is sensitive to surface roughness. Thin parts may be difficult to inspect. Linear defects oriented parallel to the sound beam can go undetected. Reference standards are often needed.